June 10: FREE Future Stages Festival! Don't miss this FREE day of non-stop family fun activities and performances at the Kauffman Center for the Performing Arts. 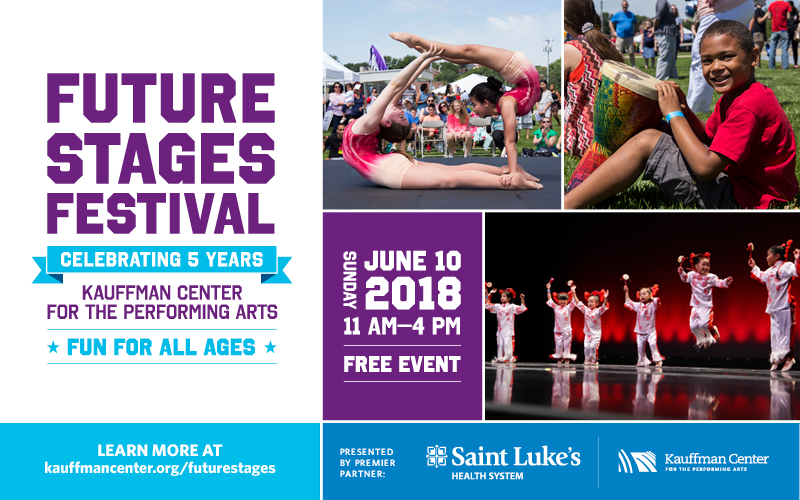 Enjoy all the performing arts have to offer at the 5th Annual Future Stages Festival! Showcasing 700+ youth performers and 35 community arts groups on four stages, including a new outdoor stage for small performance acts, this FREE event is a fun experience for all ages. Future Stages Festival also includes free arts activities and giveaways offered inside and outside the building. Please join us at the Kauffman Center on Sunday, June 10th from 11am - 4pm for a day dedicated to celebrating Kansas City's diversity in the arts! The Kansas City Symphony will have its super fun Jamie and Bush Helzberg Instrument Petting Zoo on display for children to try out different orchestral instruments. Future Stages Festival is FREE and open to the public. This is a rain or shine event. Registration is recommended but not required. Tickets will not be issued. All ages are welcome. Programming is most suitable for families with children ages 4 - 15. Parking: The most convenient parking will be available in the Arts District Garage, directly attached to the Kauffman Center just south of the building with multiple access points from surrounding streets. Parking will cost $10. Patrons are encouraged to arrive and park early. Click here to view a map of downtown parking options, provided by VisitKC. For more information, please visit kauffmancenter.com/futurestages or call the Kauffman Center at (816) 994-7222.